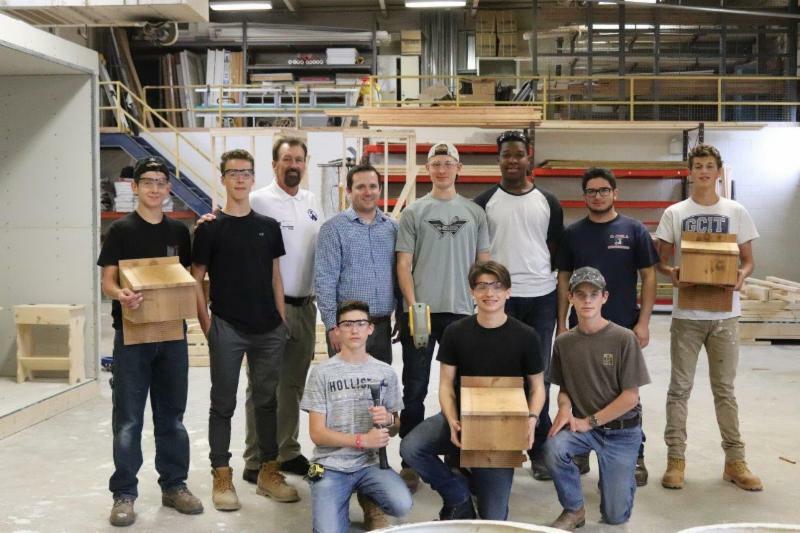 SJTA Expressway Operations Analyst Jim Leslie (third from left, back row) and Gloucester County Institute of Technology Teacher of Carpentry Stephen White (fourth, back row) join a class of GCIT students they supervised in the building of bat boxes. Hammonton, NJ - October 29, 2018 (CNBNewsnet) - The South Jersey Transportation Authority is installing 10 new bat boxes along the Atlantic City Expressway in 2018 at locations recommended by the NJ Fish and Wildlife Services, Endangered and Nongame Species Program. Started as part of its Roadway Environmental Advancement Initiative (REAdI), the SJTA initially erected 20 bat boxes last year to support local species of bats that play a critical role as both pollinators and predators which help control insect populations in South Jersey. The new bat boxes are larger and feature an even better design to attract and shelter up to 80 bats per box, according to the SJTA's Operations Department. A single brown bat can consume up to 3,000 mosquito-sized flying insects a night, and a nursing mother bat can eat up to 4,500 insects a night. Many different insect pests are consumed by bats including cucumber beetles, leaf hoppers, termites, ants, roaches, corn earworms and grasshoppers as well as mosquitos. The boxes were constructed by students at Gloucester County Institute of Technology with the assistance of SJTA craftsmen and materials provided by the SJTA. The SJTA stresses that its environmental initiative involves much more than supporting bat populations and other endangered species in South Jersey. Every year around Arbor Day, the Operations Department visits local elementary and middle schools to plant trees and present assemblies that impress on students the importance of practicing good environmental stewardship. The SJTA has visited more than 20 schools since 2011 and planted as many as 29 trees in a variety of species in the past three years. In 2019, the SJTA also plans to add 20 screech owl nesting boxes at wooded locations along the Expressway's right-of-way to create safe habitats for the owls. While the owls are still widespread and fairly common, their numbers are thought to be declining and will be helped by providing these nesting boxes. The boxes will be constructed by students of the Camden County and Gloucester County Institutes of Technology. "Because the Expressway occupies a significant environmental footprint in South Jersey that includes over 1,200 acres along its 44-mile span, we are proud to offer the REAdI program and help the local environment while serving as a vital transportation artery that supports commerce, tourism and economic growth," explains Stephen F. Dougherty, executive director of the SJTA. The program also includes reintroducing native, perennial wildflowers across 35 acres of the Expressway's right-of-way. The wildflowers attract and support important pollinators like bees and butterflies that are suffering from habitat loss and pesticide use. The goal is to reverse the population decline of these crucial pollinators. The SJTA plans to continue and expand the many facets of the REAdI as it works to exert a positive impact on the South Jersey environment.